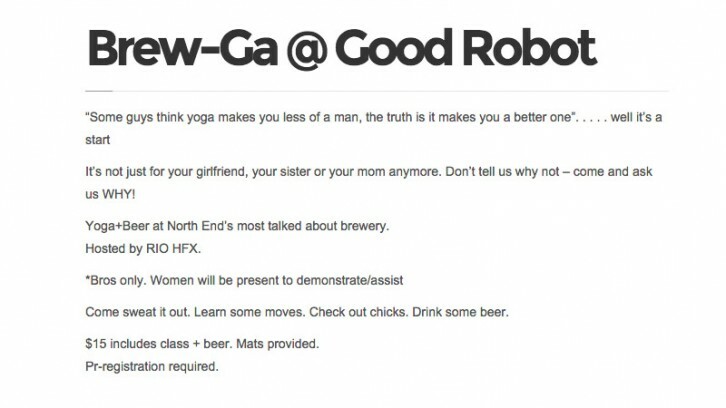 An advertisement for an event, co-hosted by Good Robot Brewing Co. and posted to their Facebook page, has attracted public criticism for inappropriate attitudes towards women. On Twitter, a screen shot of the event description has been circulating, with comments which point out language in the advertisement that people found offensive. The event was to be hosted by Good Robot and pilates and yoga studio RIO Pilates. It is now cancelled. This morning, Joshua Counsil, marketing director and co-founder of Good Robot, issued an apology on the company’s blog and their Facebook page. Counsil said he did not write the original post. He said it was written by the owner of RIO Pilates, who could not comment for the story. However, Counsil said that he did not fulfill his responsibility in reading over the post before it was published. “I feel bad for not doing my job,” he said in a phone interview.